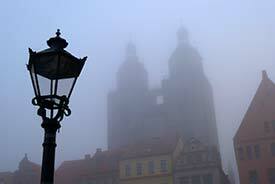 ABOVE: A foggy morning in Lutherstadt Wittenberg, with the Stadkirche's towers visible behind the market square. Of all the Luther cities in Germany, Wittenberg may be the most important: The town is home to the Schlosskirche or Castle Church where Luther nailed his 95 theses on the Power and Efficacy of Indulgences to the entrance doors on October 31, 1517. Luther was a professor of Bible studies in Wittenberg for most of his adult life, and he is buried in the church where he launched the Protestant Reformation. In 1922, the town fathers added the "Lutherstadt" prefix to Wittenberg's name, and the change was officially recognized in 1938. Today, Lutherstadt Wittenberg is an attractive town of 48,000 inhabitants that bills itself as "the Renaissance city on the Elbe." Reminders of Martin Luther are everywhere, from Luther Beer to the "Luther's Wedding" festival that attracts nearly 100,000 guests every June. In addition to being a pilgrimage site for Lutherans and other Protestants, Lutherstadt Wittenberg is the capital of a tourist region in Eastern Germany that includes the Dessau-Wörlitz Garden Realm, the original Bauhaus in Dessau, the Dübener Heath nature park, industrial monuments from the "brown coal" era, and the junction of two important cycling routes: the European Bicycle Route R1 from France to Russia and the Elbe Bicycle Path from the estuary above Hamburg to the river's source in the Czech Republic. Lutherstadt Wittenberg is pleasant at any time of year, but if you like organized events, you may want to come during Advent (when the town has a Christmas market), on Reformation Day in October, or when a fair or festival is scheduled. Even during quieter weeks, you may be able to enjoy free organ concerts and other cultural events. The city's Web site (see the "Official tourism sites" links below) has an events calendar with month-by-month listings. You can visit most of Wittenberg's churches and museums in a day, but I'd recommend arriving in the afternoon and staying two nights unless you're on a tight schedule. That way, you'll have a full day to explore the town and its monuments, plus a little extra time for casual sightseeing and shopping. 1st inset photo: 1879 woodcut after Lucas Cranach. 2nd inset photo: Klizsch/TourismusRegion Wittenberg. 3rd inset photo: TourismusRegion Wittenberg.